The use of MLLS fitting approach to resolve overlapping edges in the EELS spectrum at the atomic level | Gatan, Inc. The multiple linear least squares (MLLS) fitting routine provides a very useful means for mapping difference spectra phases or features by reference to their spectral signature. Once the MLLS is complete the algorithm returns the fit coefficients corresponding to the optimal linear combination of the specified reference spectra to the input data. In other words, the routine will fit reference spectra to a dataset and tell exactly how much of each reference is present. 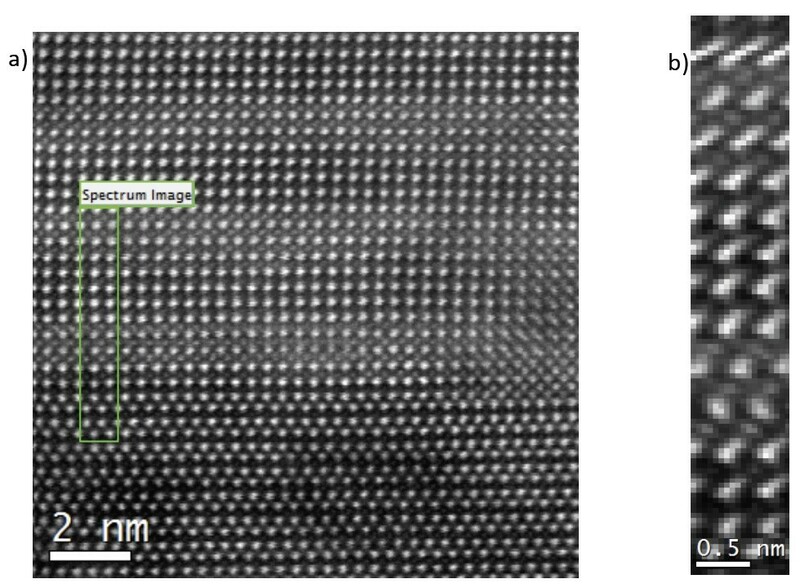 When applied to spectrum imaging, this technique becomes even more useful since not only how much of each reference is given but also its distribution. Hence if MLLS is correctly applied to a spectrum imaging (SI) dataset, it provides the ability to map the spatial distribution of the input reference spectra. A simple use for MLLS fitting is in chemical phase mapping. By specifying reference spectra that represent the main phases present, the analysis returns fit-coefficient maps showing the spatial distribution of the reference spectra. These maps may be interpreted as elemental distribution maps. For spectrum imaging analysis this can be specifically convenient since the reference spectra can often be extracted from the spectrum imaging dataset itself. In conclusion, we can say that MLLS fitting routine approach can be used for various purposes such as improving the background and for overlapping edges. What reported in this paper, it is a quite tough case where the two edges the La M4,5-edges and the Ni L2,3-edge strongly overlap and their separation at first sight seem impossible but playing a little with what the dataset offers it is possible to get the pure reference spectra and run the MLLS fitting procedure. The result is very good in terms of contrast as the atomic columns where each element is present are clear, visible and consistent with the original annular dark field (ADF) STEM image. MLLS fitting is also a very useful technique in electron energy loss spectroscopy (EELS) for separating overlapping edges. As the conventional approach to EELS edge quantification involves using the pre-edge region to model and subtract the underlying background signal, difficulties can arise where features from a preceding edge make accurate background extrapolation impossible. MLLS offers a way to overcome this problem. By specifying reference spectra that represent the overlapping signals present in the spectrum, the MLLS routine can be used to separate the signal and obtain the amount of each component. 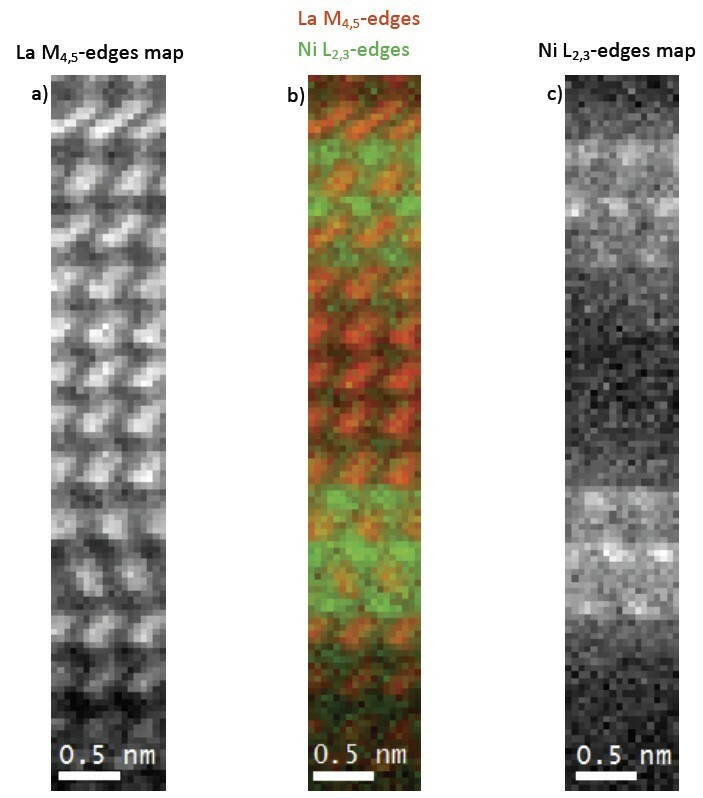 In the case of this application paper, MLLS was used to separate the La M4,5-edges at 832 eV and the Ni L2,3-edges at 855 eV and ultimately obtain atomic level elemental maps for each element. The sample is a crystalline multilayer containing layers with mixed La and Ni and layers with only La as shown in Figure 1a. The EELS SI were acquired by Dr. Nicholas Gauquet at McMaster University, in Canada using a FEI Titan Cubed 80-300 and a GIF Tridiem® 866 as EELS spectrometer. Each EELS spectrum was acquired with an acquisition time of 40 ms. Given the good signal to noise ratio that each EELS spectrum shows the acquisition time could have been shorter if a faster EELS spectrometer, such as the GIF Quantum®, would had been employed. During the acquisition, the sample was slightly drifting perhaps due to some minor charging as shown in the analog ADF image in Figure 1b simultaneously acquired during the acquisition of the EELS SI. 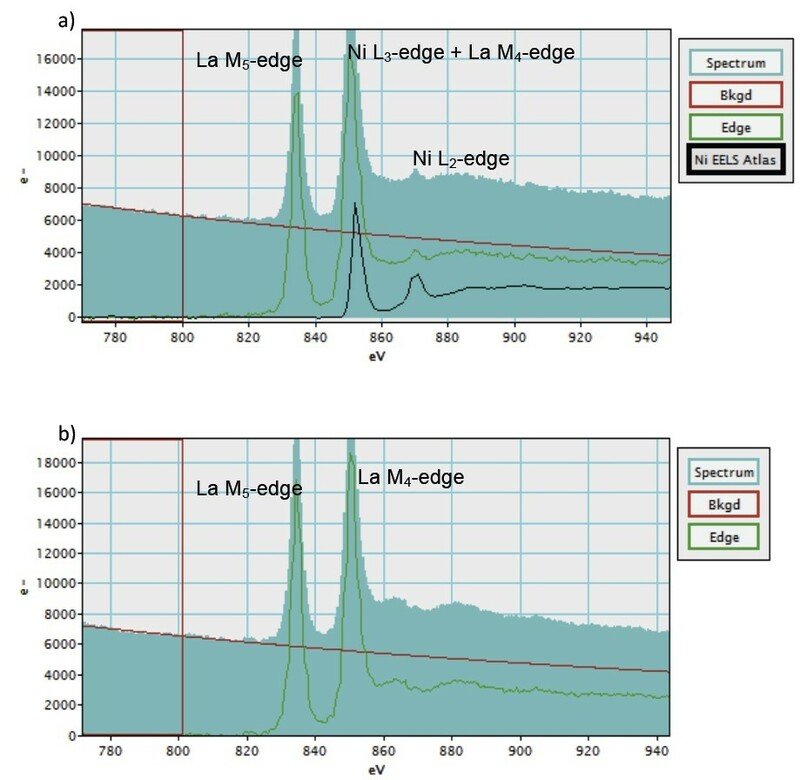 By fitting a background prior to the La M4,5-edges at 832 eV it is possible to extract two EELS spectra: one from the pure La region and the other one from the region where La and Ni region as shown in Figures 2a,b. These two EELS spectra appear slightly different as the one extracted from the La + Ni layer shows some features related to the contribution of Ni into the EELS spectrum. La M4,5-edges and Ni L2,3-edges overlap and their separation seems not trivial at all. However the full shape of the La M4,5-edges can be obtained from the layer in the sample containing only La where there seem to be no contribution from the Ni. By scaling this shape to fit the La M5-edge in the EELS spectrum extracted from the layer where both Ni and La are present and after subtraction of the two spectra, it is possible to obtain the Ni L2,3-edges as shown in Figures 3a,b. 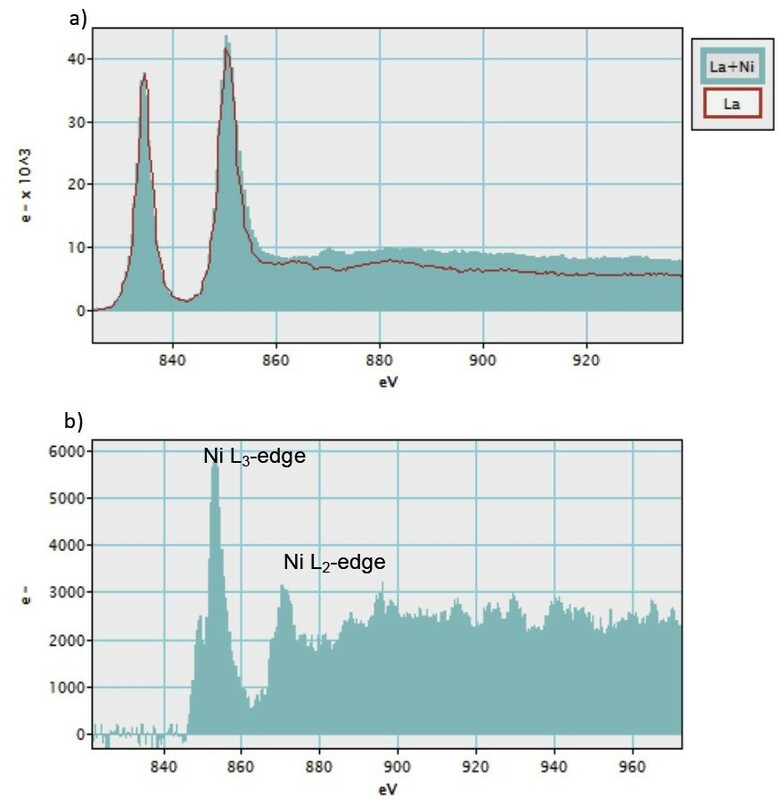 This extracted Ni L2,3-edges along with the La M4,5-edges extracted from the layer where only La is present can be used as reference spectra for the MLLS fitting routine. Figures 4a,b show the elemental maps of La and Ni obtaining using the MLLS fitting approach as described above. Both elemental maps retain their atomic level with a good contrast and they clearly show which atomic columns the La and Ni are. This is better shown in the RGB map in Figure 4c.